After a decade of R&D and more than 25 issued patents, Holosonics has developed an Audio Spotlight system priced comparably to traditional loudspeakers. Audio Spotlight technology creates a tight, narrow beam of sound that can be controlled with the same precision as light, according to the company, keeping sound focused specifically to listeners, and quiet everywhere else. Holosonics is inviting manufacturers, distributors, and retail partners to help bring this technology to a wide consumer market. With applications such as private listening for TV watching, assisted listening for the hearing impaired, and providing personal audio zones in any shared environment, Audio Spotlight technology is designed to offer a unique audio experience. Audio Spotlight speakers can also be utilized with immersive audio formats such as Dolby Atmos and DTS:X, allowing sound effects to be projected anywhere in the room, or even fly right by the listener. To facilitate fast adoption, Holosonics is offering an OEM Developer Kit consisting of an ultra-thin, proprietary 8-inch (20cm) driver and credit card-sized amplifier board. With advanced I/O functionality, the amplifier is designed to be both powerful and flexible, enabling a wide variety of integration options. These Developer Kits with Holosonics' engineering guidance and support are available for $999. 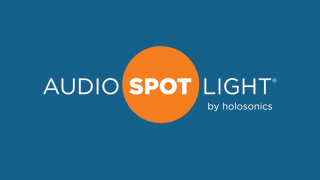 Holosonics is also offering a standalone Audio Spotlight consumer concept, for which the company expects an MSRP of $99 to $199.